In our digital world, it’s easy to overlook the power of asnail mail marketing piece. But think again because when you could earn as much as a 1,300% ROI, why would you not want to generate more leads, orders, and sales with the power of direct mail? It’s time to transform your marketing. It’s time forThe Direct Mail Revolution. Plus, you’ll receive Bly’s very own templates, samples, and checklists to ensure your direct mail materials earn you the highest ROI possible. I've seen all kinds of direct mail, but I haven't ever put much thought into what it takes to design and distribute it. The local businesses where I live don't use it too much, and, as a graphic designer, I'm interested in how I can add direct mail to what I offer. The Direct Mail Revolution looked like something that would give me the information I needed to get started. Before getting into the how of direct mail, the why is addressed. Robert W. Bly tells how printed direct mail is far from dead, and is actually preferred by many people. The book covers the whole process: planning, getting addresses, design, and writing the copy. Each area is well explained and easy to understand. The writing style is down to earth and authoritative. Pictures and examples are given to illustrate what the text says. Since electronic advertising has a purpose, integrating the digital side of direct mail, such as steering prospects to a landing page, is also included in the book. 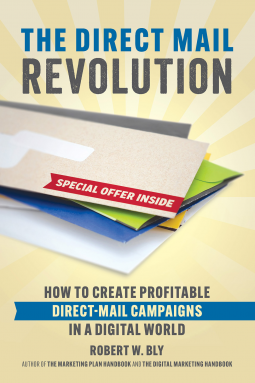 I found The Direct Mail Revolution very informative, and I'm ready to start working on putting it to use.